The AJ-PX270 can record the main video data (MXF format) with an AVC-Intra100/50 or AVC-LongG50/25 codec, while simultaneously recording proxy video data at a low bit rate. Using the network function, it is capable of IP transmission of proxy video data via LAN, wireless LAN** or 4G/LTE** network. This enables news flash distribution and advanceediting before the main video data arrives, dramatically speeding up the video production workflow. * Some formats are not supported depending on the recording mode. For details, see "Recording Codecs and Video Formats PDF". The standard LAN (Ethernet) port allows network connection via a wired LAN. When the optional AJ-WM30 Wireless Module is installed, the AJ-PX270 gains wireless LAN (IEEE 802.11g/n) connectivity, enabling access to the following functions from a network-connected PC/Mac, tablet device or smartphone. 4G/LTE connection is also possible. Playlist Editing: Playlists can be created using proxy video with a PC/Mac or tablet. The workflow can be streamlined to be faster by rough editing on location, and then transferring the content files. File Transfer: When connected via wired/wireless LAN or 4G/LTE, the FTP client function lets you transfer clips from the camera recorder to a network. * Some functions are not supported by some devices. Full-HD (1920 × 1080) proxy video*1 can be streamed via a network connection (wired LAN, wireless LAN, 4G/LTE network) while recording mainstream video onto a memory card. The video can be received and playback on a PC or Mac. It also AVC-G (QoS) and SHQ (QoS) streaming modes which prioritize uninterrupted video transmission. "QoS*2" stands for Quality of Service. Using this function, bitrate is optimized to match the network condition and continue streaming distribution even when the communication bandwidth is reduced. 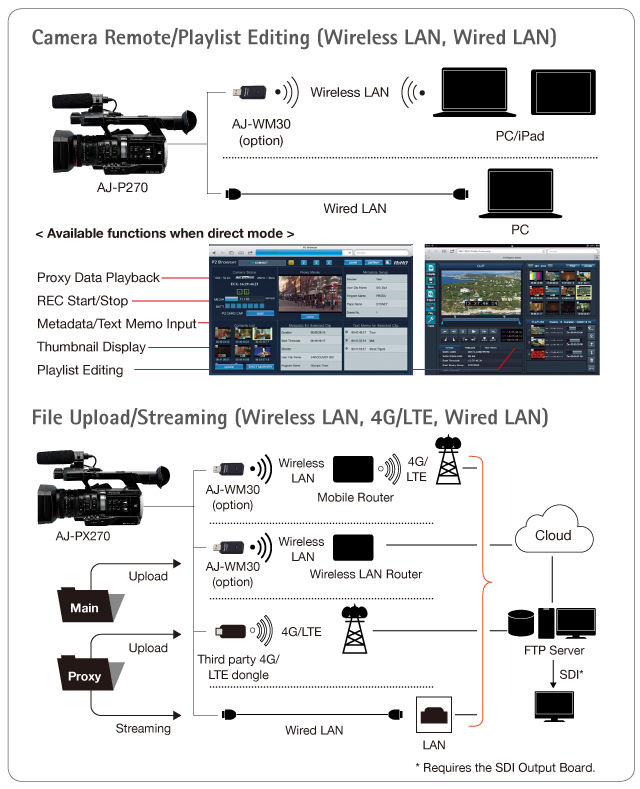 This provides solutions for a variety of situations such as news acquisition, while recording mainstream video, video for newsflash can be streamed live*3 to a broadcast station from the field. *1: When the AVC-Intra200 is selected, streaming output is not supported. When the AVC-Intra50 is selected, only SD Streaming mode is supported. *2: P2 Streaming Receiver software (Windows only, not supported by Mac; available free of charge) is required for receiving the QoS mode. *3: The video and audio signals arrive with a delay. The latency varies depending on the network environment and the hardware/software environment of the PC, server, etc. *: See the RTMP Setting Guide for the setting method. *: For information on connection confirmed live video distribution services, refer to the section on Connection Confirmed Live Video Distribution Services. *: P2 Network Setting Software is required for using the RTMP function. *: It may not be possible to deliver streaming from the unit when services such as Facebook or YouTube stopped or discontinued operation for some reason. *1: The audio codec is AAC LC 2ch in all streaming mode. *2: When only the record signal is 1080/59.94i or 1080/50i. *3: When only the record signal is 720/59.94p or 720/50p. *4: Output becomes 1080/59.94i or 1080/50i. *5: RTMP is not supported by the QoS mode. The Rec during Uploading function*, which automatically and sequentially transfers recorded clips to an FTP server or cloud service, has also been newly added. Uploading is done in the background, and recording/playback continues during the transfer. The transfer status can be checked on the LCD monitor or viewfinder. If the network is disconnected during transfer, or the power of the camera is turned off, transfer resumes when the connection or power is recovered. Manual transfer of up to 100 registered clips is also possible. * During simultaneous recording, only recorded clips in slot 1 or slot 3 are automatically transferred. Clips of interval recording, loop recording, one-clip recording or one-shot recording are not transferred automatically. While the Rec during Uploading function is enabled, Last clip delete function and streaming function are disabled. Even smoother operation is possible by using a cloud service. Proxy files that are automatically uploaded to a cloud server can be edited (remote playlist editing) from a network, and only the necessary data can be sent from the AJ-PX270 to an ingest server. 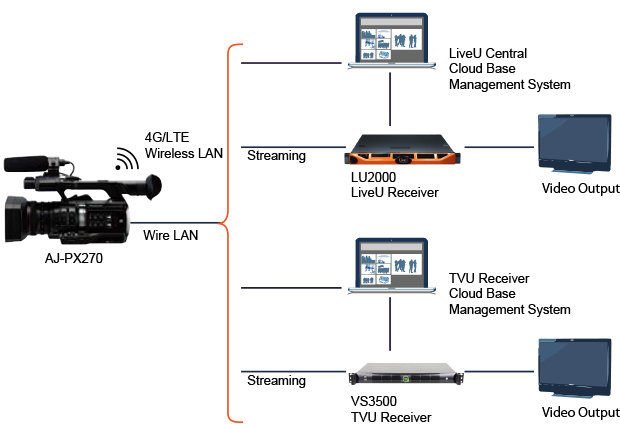 The AJ-PX270 supports direct connection to the LiveU Central management platform or TVU Networks TVU receivers using public networks, such as 4G/LTE, wireless LAN or wired LAN. There is no need for special uplink equipment. This enables both on-air streaming, and live previews on the reception side. Users are also able to remotely control the zoom, focus, iris, white balance and master gain of the AJ-PX270 on LiveU Central. * Contract with LiveU is required separately. For details, contact LiveU: http://www.liveu.tv Contact: info_us@liveu.tv (US & Americas), info@liveu.tv (International).